The most striking and distinctive feature of this medium-sized, active dog is its shaggy, corded coat. The coat can reach the ground by about four years of age and, with its tail curled over the back, it is hard to know if they are "coming or going". The Puli is a remarkably active, agile and light-footed breed, and it is highly regarded for their intelligence and trainability. It is a sensitive one-man, or family dog, which makes an intensely devoted and loyal companion. Loving and affectionate, it is wary of strangers, but extreme timidity, or aggression, are serious faults with this breed. 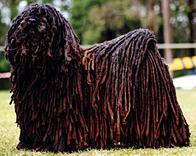 The Puli must be part of the household and does not take to isolation from its family, or being confined to a kennel. 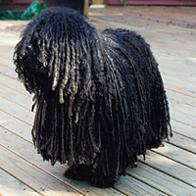 The Puli's coat will naturally develop cords and, although the dog does not need brushing, they must still be groomed. A Puli in a full, floor-length coat, requires considerable work to maintain a clean and neat appearance. The full-length coat easily collects dirt, twigs and leaves, and, these can be difficult to remove. To keep the Puli's coat in glorious condition requires devotion on the part of its owner. Bathing is essential and a heavily corded dog may take an hour to wash and up to six hours to dry, with a blow dryer. The Puli is best suited to an active, outdoor lifestyle. They are a "smarty" and make a great companion and games dog. Their intelligence, trainability and overwhelming desire to please, make them an excellent dog to own.